To call Michael Behm a music industry renaissance man is actually something of an understatement. As an artist, he’s equally comfortable working under the spotlight, behind the scenes or in a studio and has found significant success as an entrepreneur in many different facets of the music business. Years of touring through North America established him as a compelling live performer. To a still rapidly growing number of fans around the globe, Behm is best known as a singer/songwriter of real melodic and lyrical intelligence. His versatile take on pop-rock has been showcased on seven albums, including 2008’s acclaimed Saving America. Releasing a series of meticulously-crafted singles that generated serious traffic on internet radio stations and music websites, total plays of Behm tunes on numberonemusic.com now stand at over 1.6 million, while 12 songs on the popular Jango site notched well over 270,000 plays. Such singles as “If I Could Learn To Fly”, “Love’s Like Numbers,”and “Where I Belong” topped charts in Australia and Canada on such sites as mp3.au.com and Reverb Nation. As a music business entrepreneur, Behm’s credentials are equally solid. He formed a sound company “Premier Productions” in the 1990s that provided live sound and lighting to 22 music clubs in Canada. He owned five successful live venues / clubs, including three in the Caribbean, and until recently owned and operated the very popular Vancouver Island music club, Voodoo Lounge. He has promoted over 100 concerts, including such major-name acts as Nazareth, Nickelback and Default. On the songwriting front, Behm’s talent, recognized by songwriting guru Ralph Murphy (Crystal Gayle, Ronnie Milsap, Cliff Richards) culminated in The Murphy-Behm co-write “Where I Belong,”. This gently pensive pop song quickly became a fan favourite. Behm and veteran songsmith Ron Irving collaborated on the popular “It’s My Time” for American Idol. Michael Behm’s versatility as a songwriter, producer certainly brought him attention in the world of music publishing. He continues to publish a vast number of songs and highly notable movie and TV sync placements with more coming. Thanks to a collaboration with affiliates in the U.S. and Australia, a Behm track, ‘Living In The Moment,” was featured in the Disney feature A Fairy Tale. He was also commissioned to provide four songs for the soundtrack to a film biography of AC/DC singer Bon Scott. Behm expanded his reach, developing and producing international artists, “Chaps”, and “Dead Eyes Open” as well as others. Behm says, “Producing a amazing U.K. country band called “Chaps”. We signed two songs " Straight Road” and “Pensacola” to Publisher Rex Benson which were pitched to Keith Urban and Rascal Flatts. The songs were picked from 2600 song submissions and validated not only Behm’s production team but also his talent as a hard working artist, songwriter, musician and producer. Michael Behm is a frequent panelist at music industry conferences and seminars, continually expanding and refining his diverse skills and worldwide contacts. On a personal level, Behm was absolutely pumped over the response to the meticulously crafted “Saving America” – a stirring, guitar-fuelled call for change, renewed optimism and fresh hope from a Canadian to his friends and neighbours south of the border. Positive reviews, on-line streaming via services like Australia’s mp3.com and ReverbNation, resulted a rush of adds from U.S. community radio stations and built a momentum for Saving America's melodic original that bristled with memorable hooks and a historic sample from one of John F. Kennedy landmark speeches. Radio promotion by Plug Music in Canada and the Sutton Music Group in the U.S. produced spins and stations in St. Louis, Olympia and Tucson, among others, and regularly played the song. GK Radio Europe also added Behm’s music to their "must listen to" charts, validating his work as a solo artist worth paying attention to. The artist has tasted success over the years as a solo act, band leader,songwriter and producer. On the Saving America album, Behm sang, played guitar, produced and handled the multi-tracked instrumentation from his state-of-the-art home studio on Vancouver Island off Canada’s west coast. The drummer for the sessions was Pat Steward (The New Odds, Bryan Adams). “Saving America” was mixed in Vancouver by Mike Fraser (AC/DC, Elvis Costello, Metallica, Sam Roberts) and mastered at Bernie Grundman Mastering in Los Angeles by the legendary Brian “Big Bass” Gardner. The latter has put the final touch on classics by Blondie, the Beastie Boys, Black Eyed Peas and Blink 182, and that’s just a few of the Bs on an awe-inspiring list of A to Z credits. Other irons are always burning bright for Michael Behm. His U.S. publishers Rumblefish and Scorekeeper Music actively promote and expose his deep catalogue of song titles in America. His bluesy original “Take Me Down to the River” became the theme for Campbell River, B.C. adult contemporary radio station 99.7 The River. And Vancouver’s Rock 101 selected his original as the theme for the Bro Jake Show, the popular morning show hosted by Canadian DJ legend Jake Edwards. RadioIndy is pleased to present Michael Behm with a GrIndie Award for the CD "Saving America "
Talented artist Michael Behm, no stranger to the music scene, has released his fifth album, titled “Saving America.” A Canadian, Behm projects his insights about his neighbors that are south of the border through his music. This album offers up a collection of some power pop/rock tunes with creative lyrics and song titles. There is a hint of influences of band greats such as the Beatles on tracks “The Art Of Letting Go” and Danger Boy.” Not only does Behm have strong and solid vocals, but he gives listeners a taste of his guitar abilities with clean-cut power chords on “Honesty.” The ballad “Lincoln” presents another side to the range this album has, as the piano highlights a rock solid accompaniment. 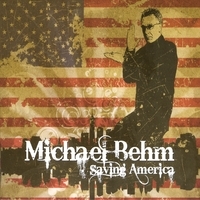 Look no further than “Saving America” by Michael Behm if you want to hear some fun and enjoyable pop/rock music. "Saving America" Reviewed by RadioIndy.com! Now That's The Ticket! Michael Behm has a Ticket To Heaven Artist: Michael Behm Album: Saving America Track: Ticket To Heaven From Vancouver, here's a Canadian artist that has a great powerpop sound and concern for America. This is really smart powerpop for the music lovers that demand something more than simple bubblegum pop choruses, Behm's songs goes deeper than that. I recently discovered this guy on his 2005 album "Love songs for the emotionally impaired" and knew his new album would be something extra, I have listened to "Saving America" quite a lot lately and must say it's even better than the previous record. The half instrumental "Underground Epic" is classic rock at it's best and the piano based "Lincoln" would make John Lennon proud. "If I had a life" bring thoughts to Bleu and songs like "Ticket to heaven" and "If I could learn to fly" could've been featured on Tal Bachman's excellent 1999 album. The title track "Saving America" takes the listener back to the heydays of E.L.O, lovely! Well, he might not save America but he could easily save your day! Absolute Power Pop "Saving America"
We Americans may have elected Barack Obama for the job, but Canadian Michael Behm is Saving America as well - one power pop fan at a time. The Vancouver rocker's second disc is a great way to start off 2009, and its late 2008 release date means I have one slot on this year's top 125 list already filled. Vocally, Behm sounds quite a bit like Tommy Keene, and a listen to the opening track "Don't Believe" will have you thinking you stumbled on a lost TK disc as he shares Keene's melodic ways as well. The title track follows, opening with a soundclip from JFK's inaugural address, and while its lyrical content may not please a certain (shrinking) segment of the US population, it's a tuneful number with a big chorus. Elsewhere, "If I Could Learn to Fly" is a fine 80s-influenced midtempo number, "The Art of Letting Go" would have fit in nicely on the recent Rob Bonfiglio album, and "Ticket to Heaven" has that Bleu/Mike Viola feel to it. Also of note is "Underground Epic" a nearly 5-minute song collage similar to those fancied by fellow countrymen Sloan on their last couple of discs, and closer "Take Me Down to the River", which in keeping with the Canadian comparisons has a Tal Bachman feel to it. While Behm may not end up Saving America, he will save you from listening to mediocre power pop. Not Lame Music on "Saving America"
I LOVE when a full developed artist arrives out the blue, flying totally under my radar until suddenly - BAM! - they land in my CD player and I fall in love with music that suprises, challenges, emotionally moves me and brings me out on the other side of joy. Michael Behm is one such artist and his two albums, the 2009 release "Saving America" and the 2004 "Love Songs For The Emotionally Impaired" are ones that I will pushing for many years to come. I review them here together, bundled in the hopes you just trust me and pick them both up as they are *that* pleasurable. The signposts of the sounds here will be familiar to many Not Lamers - Jason Falkner, Owsley, The Grays, The Rembrandts, Mike Viola and The Candy Butchers, Bleu and Jim Boggia. LISTEN to the soundbites of both albums and the quality to should be self-evident. The production quality, the arrangements reach skyward and do not stint on low-ambition. Behm is not interested in writing cookie-cutter pop music but works of kaleidoscopic tapestries lasting value. Bless the man, he delivers. "My partner in crime Par Winberg raved about Vancouver son Michael Behm earlier here on melodic.net but this is the first time I hear an album with Behm. It`s his 2005 album "Love songs for the emotionally impaired" but I`m glad I did because it`s such a classy piece of work for powerpop freaks like myself. Soundwise Behm stand somewhere between Owsley, Todd Rundgren and Jellyfish. I`m impressed by the production where the guitars are crystal clear and every other instrument lies perfect in the mix, Behm has a real nice voice that fits this sunny pop rock like a glove. " Melodic.net. This guy has been flying totally unknown by fans at places like Not Lame and I see very little written about him on Google, which is insanely perplexing, folks. Let us change that! This material not only merits investment on your shelves, but a bit of extra typing of letting the blogosphere and `net know that Michael Behm is an artist to savor. RadioIndy is pleased to announced that we have published our CD Review ofMichael Behm music to Facebook. FANS - Please checkout Michael Behm iTunes page play / purchase some great new music! RadioIndy is pleased to announced that we have published our CD Review of Michael Behm music to CD Baby. FANS - Please checkout Michael Behm online! RadioIndy created a CD Announcement Press Release for Michael Behm on Digg.com!